For yachts smaller than 50-feet, Paragon Junior is the finest high-performance water pressure system made. 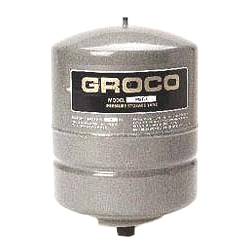 The industrial-grade pump design is suitable for fresh or salt-water operation, is self-priming (to 6-feet), and provides up to 7 GPM in the 20-40 PSI pressure range.On/Off operation is controlled by a waterproof "ignition protected" pressure switch located at the pressure storage tank.It also features the patented NOFLO™ dry tank protection. Inlet strainer, oil-filled system pressure gauge and pressure storage tank are included with PJR-A. The PRJB model places the pump on top of a 2.5 gallon (draw-down) tank, however, the PJR-A uses only the PST-1 tank and should not be substituted. For yachts 50-feet and larger, Paragon Senior is simply the finest high-performance water pressure system made. 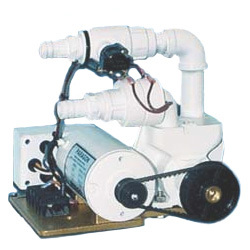 The industrial-grade rotary pump design is suitable for fresh or salt-water operation, is self-priming (to 10-feet), and provides flow up to 11 GPM.The PSR AC models are offered in 115V 60Hz, 230V 60Hz and 230V 50Hz versions. PSR DC models are UL listed and CE recognized and operate in the 30-50 PSI pressure range. Use with the largest pressure storage tank that will fit into the available space (larger tanks reduce pump cycling). PSR12 Incl.strainer, pressure gauge. Buy tank seperately. PSR24 Incl.strainer, pressure gauge. Buy tank seperately. PSR32 Incl.strainer, pressure gauge. Buy tank seperately. 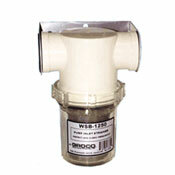 PSR115 Incl.strainer, pressure gauge. Buy tank seperately.